In Scotland Arms are heritable property, and on their original owner’s death they descend to his heir, normally his eldest son, and in turn to his eldest son, and so on forever. A younger brother may inherit his father’s Arms if the elder brother dies first and leaves no heirs of his own. 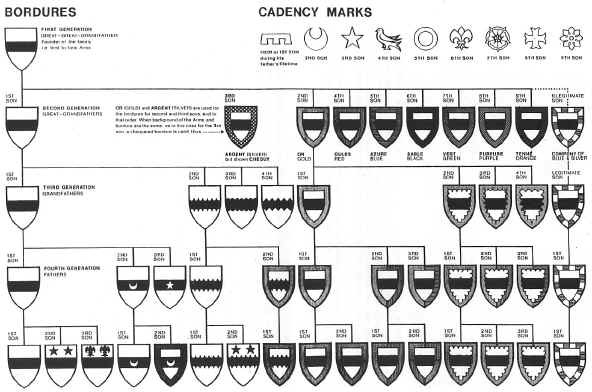 Otherwise younger sons and their descendants inherit only the right to apply for a Matriculation of their ancestral Arms with a "MARK OF DIFFERENCE" or "A DIFFERENCE" added to them. There are many methods by which the order of seniority of a family line can be shown in the differences allotted. Two of the most usual methods are set out in the diagram on the back of this sheet, the BORDURE most usual in Scottish heraldry, and CADENCY MARKS more usual in England and elsewhere. These two methods, and others, can be and often are combined. BORDURES (or borders) are allotted to an armiger’s sons in order of their birth in a set sequence of colours which shows their seniority, thus:- 2nd son, Or; 3rd son, Argent; 4th son, Gules; 5th son, Azure; 6th son, Sable; and so on. The first or eldest son inherits the Arms undifferenced. Where the bordure in this sequence happens to be of the same colours as the field of the Shield, it is made "chequy" (chequered) of that colour and a contrasting one. In the next generation, the 3rd from the founder, this system continues as above for younger sons as it shows the seniority of their descent from the founder, NOT their father. When the previous generation, the 2nd had already borne a bordure for difference as is shown in the diagram where all the 2nd generation’s borders have been used up, the bordure is further differenced by varying its inner edge in a set sequence of patterns as shown. This combination of varying colours and patterns of border continues in the same way for each subsequent generation. 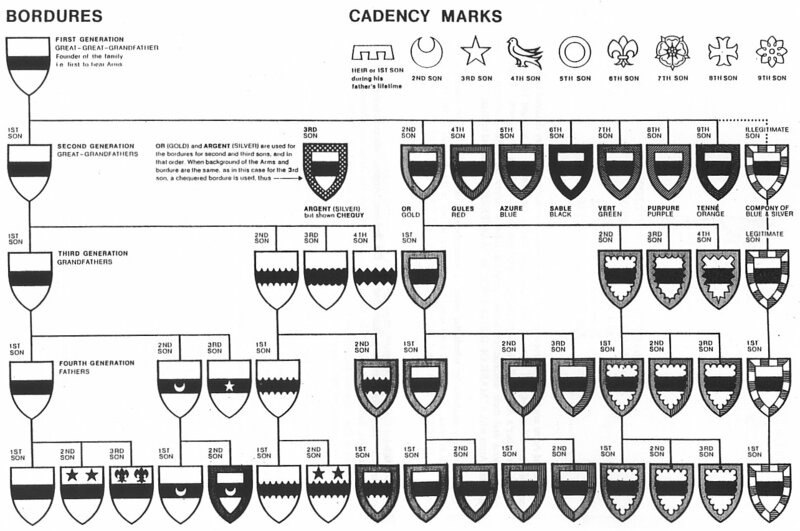 When these differences as in the diagram are not available to younger sons of the senior line, having been used by junior lines, an alternative system or systems is used as shown, such as adding small marks of cadency or varying the edge of the main charge on the Shield. An illegitimate son is accorded a special border of blue and white, called a "bordure compony". This is inherited by all his legitimate descendants thereafter, varied in similar ways. In certain cases differences are allotted for a lady of a junior line matriculating Arms in her own right. It is entirely for the Lord Lyon alone to decide which differences to allot when matriculating Arms as he alone knows all the differences which have already been allotted from the systems and are recorded in the Public Register of All Arms and Bearings in Scotland, and the principles on which they are allotted and should continue to be allotted.